Nothing keeps these STEM students from competing – not even a hurricane. building competition. JSS is the result of a partnership between the Army Educational Outreach Program (AEOP) and the Florida Solar Energy Center (FSEC), a research institute of the University of Central Florida (UCF). JSS teams design and create solar-powered cars by using hands-on engineering skills. 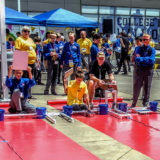 In the process, they develop teamwork and problem-solving abilities, which also prepare them for regional competitions held throughout the school year. On your marks! Due to overcast skies, JSS teams cover their solar panels and race their JSS vehicles using battery power at EnergyWhiz. Through the program’s curriculum, students are introduced to new concepts and technologies. The first few sessions of this pilot program, JSS: Connecting Communities with Opportunities for Success (C2OS), focused on learning about design, solar technology and engineering principles. It all became real for the students when they applied those concepts to their vehicle designs. STEM skills were needed as they aligned gears, soldered wires, calculated and measured to complete their vehicles while maximizing efficiency and speed. Once the students could see their vehicles moving in the sunlight, students were buzzing with new ideas. After each turn at the track, the team would rush to the fix-it table to make improvements – just as engineers do – to maximize their vehicles’ performance. At the next school session, cloudy skies required students to run their vehicles on solar charged batteries. Now students could understand why they had to solder and affix a battery holder to their car. 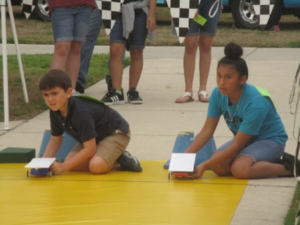 After refining their designs, testing their cars’ performance and decorating their vehicles, it was race time. The enthusiasm for the JSS racers was contagious, as Saturn students and staff cheered from the sidelines as each set of cars sped down the track. Two teams, Shakamelina and MX, were triumphant and moved on to a much larger competition at FSEC’s EnergyWhiz event and one step closer to the national competition at the 2018 Technology Student Association Conference in Atlanta. Both teams finished in fourth place in the Elementary and Middle School Racing Divisions at EnergyWhiz. Although the teams didn’t get the all expenses paid trip to the National JSS competition, they were excited to compete against top Florida teams and outperform many more seasoned competitiors. 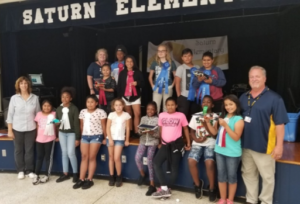 A capstone celebration at Saturn Elementary was held where all the afterschool students watched photos and videos from the JSS races at EnergyWhiz. JSS participants, even those that did not race at EnergyWhiz, received certificates and ribbons, and enjoyed a slice of pizza and cake. Nearly in unison the students asked, do we get to build solar cars again next year? 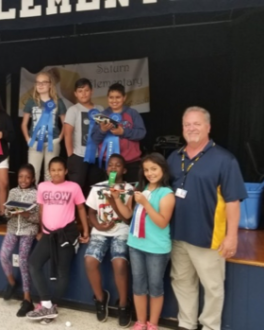 Saturn afterschool staff and the Florida Solar Energy Center mentor pose for a photo with the students after receiving their prizes.